Every Formula 1 pilot dreams to win on the Mythical circuit of Monaco which is the slowest and hardest of the Formula 1 World Championship TM . The one who wins in Monaco deserves it because even a small error in the streets of the principality is fatal. The qualifications are always determining, the overpass being almost impossible. However, the number of abandons being high, a good control can ensure a place in the points. It was the second circuit of the history to receive formulas 1 in 1950 (May 21), after Silverstone, but there were races since 1929. It is one of last "circuits of men" where the talent of the pilot can still make the difference (Ayrton Senna won it 6 times. The circuit, which remained nearly identical since 1950, is 3,340 km long. Passed the line, the pilot arrives at Sainte Dévote curve, place of many accidents. The track goes up until the left-right of the Casino of Monte-Carlo, in front of the Hotel de Paris, from there, goes down again to the right curve of the Mirabeau. It continues then to the slowest turn of the championship : Virage Fairmont (formerly Virage Loews), on the site of which is the Fairmont Hotel Monte-Carlo. The section of the Portier brings to the sea, where the track borrows a tunnel and carries out to the baffle close to the port, beside the hotel Port Palace Monaco and the hotel Miramar Monaco. Then turn on the left of the Tobacco Shop, the section of the Swimming pool, then the stiff turn on the right with Rascasse, follow-up of the curve Anthony Noghes, then finally the line of the stands. 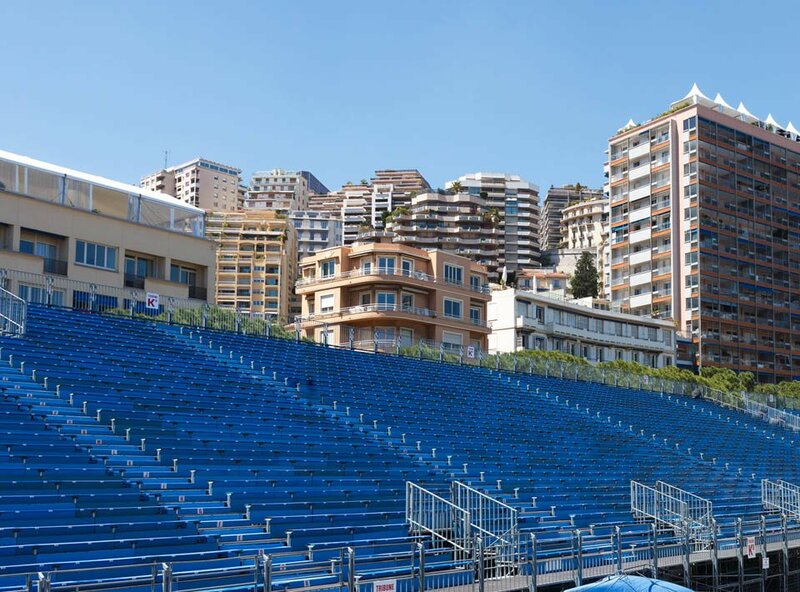 - 2004, the doubling of the width of the esplanade accomodating the zone of the stands on the level of the Boulevard Albert 1st, by the creation of a building on the influence of the old track between the swimming pool and Rascasse. New stands representing an area of 250 square meters will be placed at the disposal of each team. 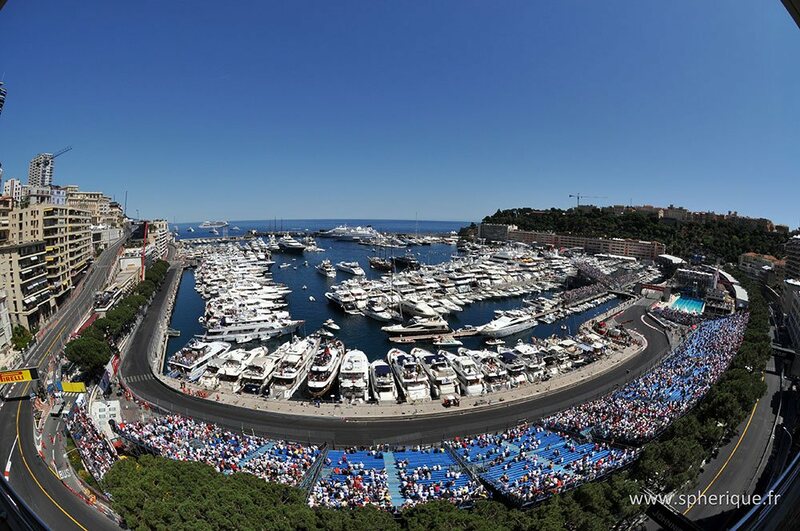 To come to the Monaco Historic Grand Prix is something you have to organize and to anticipate. Tickets, hotel, restaurant, limousine, for every step our staff can assist you. You want to watch the race from a terrace with VIP hospitality or to organize a reception in parallel. For all this we put our staff at your disposal, our team can propose you tickets, passes, terraces, cocktail, reception, hotel, limousine, yacht, VIP service. Simply choose a service, complete the form below and we will contact you shortly. 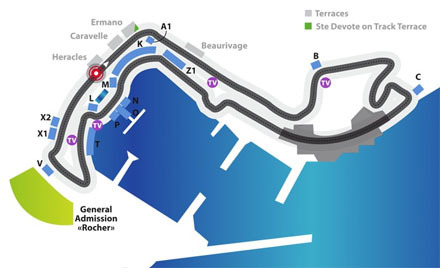 You want to watch the Grand Prix Historique from one of the Grandstands along the circuit. select on the map the Grandstand you prefer and click to see availability and price then buy your tickets for the Grand Prix.